Australia's trusted Concise Australian Dictionary app is both international and uniquely Australian, providing users with the most comprehensive, authoritative and up-to-date reference of Australian English. The app answers the needs of users on matters of spelling, pronunciation and usage for the complete record of English as it is used in Australia, from the colourfully colloquial to the highly technical. *Note that access to audio pronunciations requires internet connection. 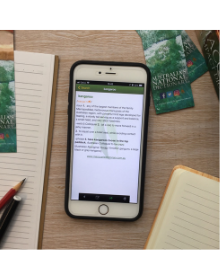 All Macquarie Dictionary iOS apps are available to both Education and Business at a 50% discount when purchased through the Apple Volume Purchase Program.